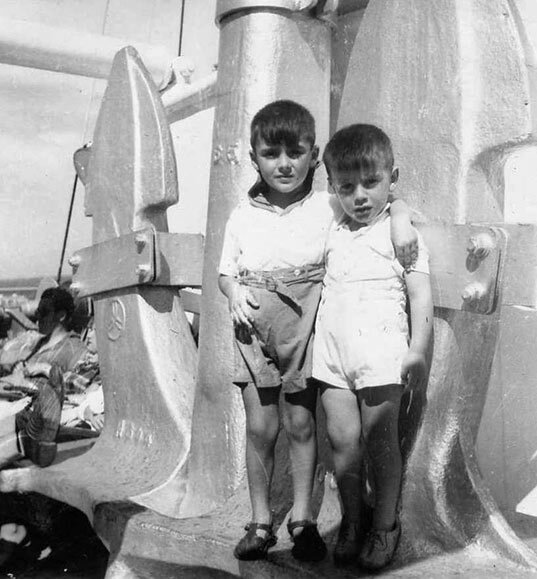 Black and white photograph of Giovanni (John) Lucente and his brother Rocco Lucente aboard the passenger ship the Conte Biancamano. John Lucente was born in 1946 in Aprigliano, Calabria, Italy. His brother Rocco was born in 1948. Their father Pasqualino Lucente left Italy in October of 1950, flying to Canada to work on a farm as part of a government work program. He settled in Windsor, Ontario and after a short time working on a chicken farm, he found work as a carpenter. John, Rocco and their mother Angelo Bruno left Italy from Naples in August of 1951 to join their father in Canada. They spent 10 days aboard the ship and eventually docked in Halifax on August 22, 1951. According to the archives at Pier 21 in Halifax, Nova Scotia the Conte Biancamano stopped at the following ports: New York, Halifax-Lisbon, Gibraltar, Palermo, Naples, Cannes and Genoa.